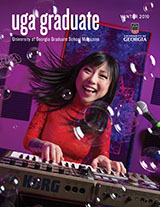 The Graduate School offers certain combined degrees with other schools and colleges in the University. Selected students in the College of Arts and Sciences may be eligible for completion of combined AB and MA or BS and MS programs in a four-year period. Students interested in these degree objectives should contact the University Honors Program. Once a student in one of these programs is admitted to the Graduate School, he or she is considered to be a graduate student for enrollment and fee purposes. This may interfere with undergraduate financial aid awards and loans.